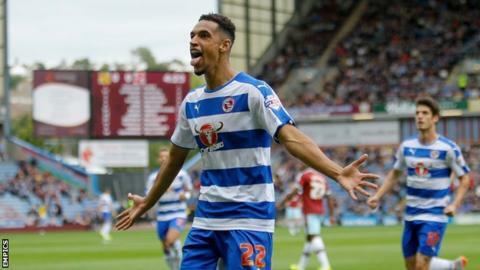 Reading scored twice in the opening nine minutes against Burnley to earn their fourth away win in a row and move third in the Championship. They led when Nick Blackman slotted home from Hal Robson-Kanu's back-heel. It was soon 2-0 as Chelsea loanee Lucas Piazon finished a fine counter-attack for his first Reading goal. The hosts pulled one back when Tendayi Darikwa tapped in at the back post from Scott Arfield's delivery, but a first home defeat drops them to sixth. With his side lacking in creativity, Clarets manager Sean Dyche brought on former QPR midfielder Joey Barton for his debut, but Darikwa's first goal for the club was as good as it got for the home side. They were undone by a fine start from the Royals, who took the lead when Burnley defender Michael Keane failed to clear, allowing Wales international Robson-Kanu to brilliantly set up Blackman, who calmly finished into the corner. Steve Clarke's side then produced a superb passing move, with Chris Gunter putting in a low right-wing cross for Brazilian Piazon to score on his fourth Royals appearance. Burnley, who had begun the day third in the table, saw Michael Kightly force visiting keeper Jonathan Bond into a fine save, but that was as close as they came in the first half. After Darikwa's goal, Burnley forward Sam Vokes' deflected strike was parried by Bond, but the Clarets needed Darikwa to clear off the line from Blackman. At the other end, Oliver Norwood cleared off his own line from Keane's header, and Norwood then hit the bar with a free-kick as the Royals held on to move above their hosts. "It's unusual for us to start so sloppy really. They scored a first from us crossing the ball and a breakaway and a bit of a mix-up really so it's a mistake from us and the second one was good play from them. "After that I thought the response was excellent. The way the team went about it for the rest of the game, the chances we created were certainly enough to get something from the game. "We kept them to mainly long-distance efforts apart from one at the end where it got a bit of a scramble in the box. "You can't give a two-goal head-start to anyone at any level of football. It's very difficult then." "The idea is always to be competitive in the division and I think after quite a slow start, not performance-wise but results-wise, we're starting to pick up wins now so that's four wins out of the last five games. "If you continue to do that in this league, who knows what can happen because if you're able to string together a run of wins, as Burnley did which took them into the top six and as we've done recently, you can quickly get up the table. "But there's no point in getting too excited about the table in September." Match ends, Burnley 1, Reading 2. Second Half ends, Burnley 1, Reading 2. Corner, Burnley. Conceded by Paul McShane. Attempt blocked. George Boyd (Burnley) right footed shot from the centre of the box is blocked. Assisted by Sam Vokes with a headed pass. Foul by Michael Keane (Burnley). Jake Cooper (Reading) wins a free kick in the defensive half. Danny Williams (Reading) is shown the yellow card for a bad foul. Aaron Tshibola (Reading) wins a free kick in the attacking half. Attempt blocked. Danny Williams (Reading) right footed shot from the centre of the box is blocked. Assisted by Hal Robson-Kanu. Attempt saved. Sam Vokes (Burnley) left footed shot from the centre of the box is saved in the bottom left corner. Assisted by Matthew Taylor with a cross. Corner, Burnley. Conceded by Chris Gunter. Substitution, Reading. Jake Cooper replaces Oliver Norwood. Attempt missed. Danny Williams (Reading) right footed shot from outside the box is high and wide to the right following a set piece situation. Oliver Norwood (Reading) hits the bar with a right footed shot from outside the box from a direct free kick. Corner, Burnley. Conceded by Jordan Obita. Offside, Reading. Danny Williams tries a through ball, but Ola John is caught offside. Attempt saved. Hal Robson-Kanu (Reading) left footed shot from outside the box is saved in the bottom left corner. Assisted by Paul McShane with a headed pass. Attempt blocked. Hal Robson-Kanu (Reading) right footed shot from the centre of the box is blocked. Assisted by Danny Williams. Attempt missed. Oliver Norwood (Reading) right footed shot from more than 35 yards is too high. Assisted by Aaron Tshibola. Substitution, Reading. Ola John replaces Garath McCleary. Attempt saved. Garath McCleary (Reading) right footed shot from outside the box is saved in the bottom left corner. Assisted by Aaron Tshibola. Attempt saved. Sam Vokes (Burnley) right footed shot from outside the box is saved in the centre of the goal. Corner, Burnley. Conceded by Oliver Norwood. Attempt saved. Danny Williams (Reading) right footed shot from the right side of the box is saved in the bottom left corner. Assisted by Nick Blackman. Offside, Burnley. Joey Barton tries a through ball, but Chris Long is caught offside. Substitution, Reading. Aaron Tshibola replaces Lucas Piazon. Delay in match Jonathan Bond (Reading) because of an injury. Goal! Burnley 1, Reading 2. Tendayi Darikwa (Burnley) right footed shot from the right side of the six yard box to the bottom right corner. Assisted by Scott Arfield with a cross.